Hunter College High School is lucky to have its own leader just for grades 7-9 - it's Assistant Principal for Grades 7-9, David Joffe. On May 20th, Mr. Joffe greeted a packed double room of parents with students in grades 7-9 to give an informative talk and Q&A session. Dr. Fisher, Principal of Hunter College High School, chimed in. In 7th grade, the students are just getting adjusted to Hunter. There is a lot that's new, including the new school, new commute, open campus, etc. 8th graders have an adjustment to harder academic standards - they use high school textbooks. 9th grade is a big social adjustment - they students are dealing with high schoolers, there is no traveling class, and there is no grade-wide counselor. Hunter recognizes these phases of adjustments, and helps students cope with them. Mr. Joffe said, "Your children are awesome. I enjoy working here, and being around them. We're working on letting the kids know how much we care about them." 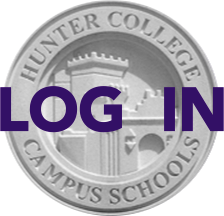 Dr. Fisher added that Hunter College High School has an internal review cycle, and that it had been a long-term goal for decades to try to treat the 7th and 8th graders less like "little high school students." He said, "We've been working on getting grades 7-8 to feel like a middle school." He mentioned that some 9th grade students wrote a "brilliant op-ed" that pointed out "the schizophrenia of the 9th grade at Hunter." In the 9th grade, Dr. Fisher said, most students will experience their first exposure to substances and other adult experiences. Dr. Fisher stated, "You are lucky to have Mr. Joffe - his background as a middle school teacher helps him be a great administrator!" A parent question that was submitted in advance had to do with the homework load. Mr. Joffe said, "The amount of work the students are getting now is less than they were ten - or even five - years ago." For instance, Social Studies used to have two term papers, and now only has one. Teachers are trying to use the online schedule to avoid conflicts with tests. The teachers also spend time twice a year to log all major projects. To answer a question about the homework posting policy, Mr. Joffe said that teachers are supposed to either tell students in class what homework there is or post it by 3pm. If the teachers write it on the board, the students should write it down. If teachers are not explaining the homework in class and posting late, the student and/or parent can respectfully contact the teacher to address the issue. Dr. Fisher said homework is usually on the board. Mr. Joffe said it could also be on syllabus. Teachers are told to give one night's homework over break. Sometimes there are long-term assignments, but they're not given the Friday before and due the Monday after. And students may have to go to the library for a long-term assignment, and should plan ahead for this. The teachers usually scaffold the assignments, but kids sometimes procrastinate and have to do all at the end. Some kids re-write the textbook, which would take 3 hours instead of 30-40 mins. - there is no need to do that. Mr. Joffe said that the homework load is impacted by social media distractions. It's also changed the social dynamics: "If you don't like a kid, it's hard to get away from them, since they'll be there on social media when you get home," he said. Kids who keep checking social media or texting, will cause the homework to take all night. Kids don't need the internet for homework - he recommends to just check for 15 minutes, then disconnect. If kids "work together," they often all come in with the wrong answer. 13-year-olds need our help to turn off distractions, because it's hard for them when they want to be cool. Dr. Fisher said this year, there was a problem because the quarter ended one week after April break. Kids pleaded with teachers to postpone the assignments because there was too much work. This coming year, that will not happen because of the timing of Spring break. A parent asked about traveling classes and activities. Mr. Joffe said that, while there is no traveling class in 9th grade, there are limitations due to space. For example, chorus kids may be in same science and English and clumped together. And swimming at the college means periods are restricted. Students do not have electives until their Junior year, but there are choices before then. A parent asked about getting more diversity in the clumps, but the school cannot do that because the students choose their activities. Mr. Joffe explained that the clubs are student-led. The adviser is there to help. If there is a problem, the student should go to the adviser or Mr. Joffe. There is more time for clubs in 9th grade. There is a list of clubs kept by the G.O. on school website. It's available through the Resources page for parents. Mr. Joffe also mentioned that jazz band has auditions in June. A parent asked about summer commitments for clubs. Mr. Joffe explained that clubs do not meet in the summer, but there are "co-curricular" activities, such as Science Research Program, which have a summer commitment. Other co-curriculars are Model UN, Washington seminar (offered by the social studies dept. ), and math team. In these activities, you don't get a grade, and can't fail, but they do expect a commitment. They're in the course catalog. If you have questions, contact the dept head. Dr. Fisher said, "Yes, there's a mouse problem, and yes, we're addressing it." He explained that they tried to address it over Spring Break, but that was unsuccessful, and said we cannot use poison. The External Affairs Department has an office and website to learn about community service opportunities and summer opportunities. Students need to ask the department head or go to the office. Clubs also offer community service opportunities.